A Personal Appeal for Support A.F.A.R. •New Track Just Five Supporters A.F.A.R. from Your iPod! Last month the Ancient Future Times featured news from A.F.A.R. The concept is to involve you, fans of world fusion music, in supporting the creation of the Archive of Future Ancient Recordings, a collection of new live and studio recordings that will be available to subscribers (YOU) as they are created. We are now 2% of the way to our financial goal of supporting the creation of a brand new Ancient Future recording of cross-cultural collaborations. We really do need YOUR help to continue to bring you new music from Ancient Future, so we've sweetened the deal by making our $10 support reward include select 128 kpbs downloads from our legacy recording archives plus brand new recordings as they are created. Even at the $10 level you'll be able to keep up with the progress of the recording throughout the term of the project. If just 10% of the people who get this newsletter today contribute just $10 each, we'll be 25% of the way to our fundraising goal and we can really get the ball rolling on new cross-cultural collaborations! You can even give A.F.A.R. as a gift and we will deliver your gift of supporter membership via email to the recipient of your choice! It is a great last minute gift that will keep on giving with new music over the next year. New Track Just Five Supporters A.F.A.R. from Your iPod! There are already four songs in the archive. This week I put some time in myself to personally sweeten the deal even further! I spent two full days mixing and mastering a live recording of my song, 'Moonbath' from Ancient Future's 30th anniversary concert at the Freight and Salvage last July. In December, 1978, Ancient Future went into Tres Virgos Studio in Mill Valley to begin work on the first Ancient Future record, Visions of a Peaceful Planet, and 'Moonbath' was the first song we recorded. 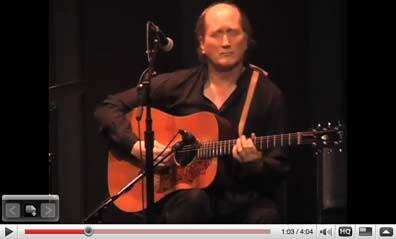 The version from the 30th anniversary concert is a very delicate and moving duet featuring myself on scalloped fretboard guitar and Mariah Parker on hammered dulcimer. I love how it turned out. As soon as we add just five more subscribers, I'll add 'Moonbath' to the download archive! Your support can be what puts this song in the archive! Please sign up for A.F.A.R. now and join us on this creative cross-cultural journey in the new year! You can also help by spreading word of A.F.A.R. afar, so please share this with your friends near and afar! Recording Newsletter Package: $10. Buy 1 Now. Receive the A.F.A.R. Email Newsletter which provides a window on the creative process, good quality 128 kbps digital downloads of selected legacy recordings chosen from the Ancient Future archives of live concerts, radio performances, and unreleased performances, good quality 128 kbps digital downloads of selected music to be recorded especially for the A.F.A.R. project, and a 30% discount on advance copies of the final commercial release. Be a virtual fly-on-the-wall during the recording process! Download Supporter Package: $25. Buy 1 Now. This offers everything included in the Recording Newsletter Package plus high quality 320 kbps downloads of all legacy recordings chosen from the Ancient Future archives of live concerts, radio performances, and unreleased performances, high quality 320 kbps digital downloads of all music to be recorded especially for the A.F.A.R. project forming an exclusive preview audio recording with digital liner notes that will not otherwise be available in shops (selections from which will form a final public edition), and the chance to submit feedback to questions posed in the recording newsletter. Limited to 300 packages. Limited Edition CD Sponsor Package: $50. Buy 1 Now. This package offers everything included in the Download Supporter Package plus an exclusive limited edition CD-R of the same recording with printed liner notes signed by Ancient Future leader Matthew Montfort. Limited to 200 packages. Honorary A & R Representative Package: $75. Buy 1 Now. This package offers everything included in the Limited Edition CD Sponsor Package plus a DVD-R including video and 24 bit audio files for hi-rez playback on computers. This is the perfect package for audiophiles and home studio enthusiasts! Limited to 100 packages. Sangria by Mariah Parker and Seven Serenades for Scalloped Fretboard Guitar by Matthew Montfort have just been selected for New Paradigm Digest's Top 5 Holiday Gifts of 2009! In celebration, we are continuing our CD sale for the holidays at Ancient-Future.Com. All of the proceeds go directly to supporting the music. The holiday sale features free regular shipping in the USA on everything in the catalog in the USA and very special deals on our new releases! For last minute gifts, we also offer overnight shipping. Holiday Checkout Option Sale! 3 Releases Celebrating 30 Years of World Music for $30! Purchase any of these releases and you will have the option of adding the other new releases for a total of $30 for all three! Seven Serenades for Scalloped Fretboard Guitar by Matthew Montfort. Ancient-Future.Com AF 2008. 6-panel Digipak CD: $17.98. Buy 1 Now. (>YTmusic). Sangria by Mariah Parker. Ancient-Future.Com Records AF-2017. 6-panel Digipak CD: $17.98. Buy 1 Now. (>YTmusic). To win a pair of free tickets for admission to Matthew Montfort's 1/17/2010 show at Peña Pachamama in San Francisco, simply send an email to info@ancient-future.com with your idea for the best way to gather support A.F.A.R.. Best idea wins! January 1-3, 2010, 8:30 p.m. 1/1/2010 through 11:30 am 1/3/2010,World Music Workshop with Matthew Montfort , Esalen Institute, Highway 1, Big Sur, CA 93920. Cost: Workshop alone: Regular Rate- $385. Friends of Esalen Rate- $335. With Bunk Bed Room: Regular Rate- $530. Friends of Esalen Rate- $480. With standard accommodations: Regular Rate-$670. Friends of Esalen Rate- $620. Standard accommodations are shared housing with two or three persons per room. Contact Esalen for other options. Reservations: 831-667-3005. Reservations: 831-667-3005, Registration Form: www.esalen.org/assetts/RezForm.pdf. Fax: 831-667-2724. Email: info@esalen.org. Download event poster: 01/01/10 Esalen Workshop.pdf (628 k). Full Press Release. Facebook Event. January 6, 2010, Survey of World Rhythms Class with Matthew Montfort , eight Wednesdays from 7:00 pm to 8:15 pm starting 1/6/2010, Zambaleta World Music and Dance School, 2929 19th Street, San Francisco, CA 94110. Cost: $135 ($121.5 for members). Info: 415.341.1333. Facebook Event. January 6, 2010, Melodic Improvisation Through the Music of North India with Matthew Montfort , eight Wednesdays from 8:30 pm to 9:45 pm starting 1/6/2010, Zambaleta World Music and Dance School, 2929 19th Street, San Francisco, CA 94110. Cost: $135 ($121.5 for members). Info: 415.341.1333. Facebook Event. January 19, 2010, Get Rhythm with Matthew Montfort , 10 Tuesdays from 6:00 pm to 7:00 pm, Blue Bear School of Music, Fort Mason Center, Building D, San Francisco, CA 94123. Info: 415.673.3600. 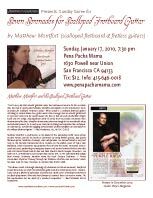 January 19, 2010, Music Theory for Guitar with Matthew Montfort , 10 Tuesdays from 7:00 pm to 8:00 pm, Blue Bear School of Music, Fort Mason Center, Building D, San Francisco, CA 94123. Info: 415.673.3600. Matthew Montfort holds a B.A. in World Music and Composition and an M.A. in Arts and Media Technology from Antioch University. 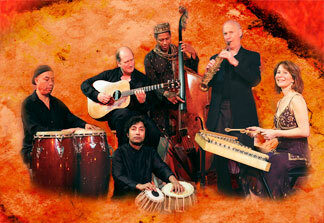 He is the leader of the world fusion music ensemble Ancient Future. A pioneer of the scalloped fretboard guitar (an instrument combining qualities of the South Indian vina and the steel string guitar), Montfort spent three months in intensive study with vina master K.S. Subramanian in order to fully apply the South Indian gamaka (note-bending) techniques to the guitar. He has performed concerts worldwide, including at the Festival Internacional de la Guitarra on the golden coast of Spain near Barcelona. He teaches private lessons at the Blue Bear School of Music in San Rafael and at his studio in San Rafael. He has a few openings for new students starting in January 2010. 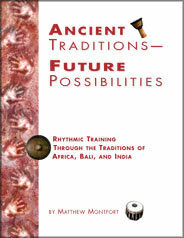 Matthew Montfort is the author of Ancient Traditions -- Future Possibilities: Rhythmic Training Through the Traditions of Africa, Bali and India. Material from the book has been used by many teachers and musicians around the world, including Reinhard Flatischler, founder of the TaKeTiNa rhythm training process, and Steve Smith, famed jazz and rock drummer. The rhythm training presented in an easy to follow, entertaining yet educational format for all music lovers. The rhythm classes and workshops are open to all levels, and no musical background is required. Very simple to play percussion instruments will be provided, and participants are free to bring any percussive or melodic instruments they enjoy playing. Ancient Traditions–Future Possibilities: Rhythmic Training Through the Traditions of Africa, Bali, and India by Matthew Montfort. Book/Enhanced Audio CD Set with MIDI Soundfiles: $52.95 (SALE! Normally $69.95). Buy 1 Now. "You've heard Afro-Pop, sitar, gamelan and world music for years. But do you know what they are and how they work? Better yet, would you like to play those twisted cross-rhythms and melodies? In Ancient Traditions--Future Possibilities, Matthew Montfort, a founding member of the world music band Ancient Future, has put together the book for people who want to dig into world music with both hands. The first section of the book covers traditional music of West Africa, Bali and India with theories and exercises. Wherever possible, Montfort has provided beat counts alongside the standard musical notation so even if you can't read music, you can still learn the rhythms." – Richard Kadrey, SAN FRANCISCO CHRONICLE. No previous knowledge of world music traditions is required for this training. Basic vocal or instrumental technique is required, including comfortability in playing or singing with a tonic C, D, or E. The following materials are offered as a preview of the training. 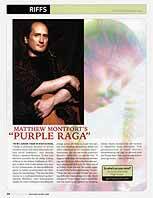 Guitar Player Magazine interview with Matthew Montfort with online music lesson and video. Educational Digital Liner Notes- $2.98 (SALE $2.00): Buy 1 Now. This exclusive download is a 17 page .pdf of liner notes for Seven Serenades for Scalloped Fretboard Guitar by Matthew Montfort that is not available at any other music download site. ?These educational liner notes explain the inspirations and musical concepts behind each of the serenades. Sheet music is included for those who want to delve deeper! This soiree for Seven Serenades for Scalloped Fretboard Guitar celebrates the debut solo recording by Ancient Future leader Matthew Montfort. Montfort will perform on both the scalloped fretboard guitar, a special modified instrument able to produce ornaments more characteristic of the sitar, and on a Godin Glissentar, an 11 string fretless guitar based on the oud. While previously known more for his compositions for the trendsetting world music group Ancient Future, Seven Serenades features his intimate improvisational guitar work. Seven Serenades for Scalloped Fretboard Guitar by Matthew Montfort. Buy 1 Now. The official Ancient Future app for the iPhone or iPod Touch is now available. This app helps Ancient Future fans keep up with the world fusion music ensemble's activities while on the go. Sample Ancient Future music, check out the latest Ancient Future videos and photos (including iPhone app exclusives), read blog posts, and get regular bulletin updates on the band's ambitious new fan supported recording project, A.F.A.R. - the Archive of Future Ancient Recordings. Side effects: In rare cases, the Ancient Future iPhone app may cause temporary temporal displacement of the psycho-acoustic variety. If you experience a psycho-acoustic temporal displacement lasting longer than four hours, enjoy your vacation.